Hurricane Ike has moved into the Gulf of Mexico and has begun strengthening. Computer models indicate that the likely landfall target will be Texas. Near 23.9 north, 85.3 west. About 125 miles north of the western tip of Cuba, or 434 miles southeast of the mouth of the Mississippi River. Hurricane Ike has weakened to a Category 1 storm after crossing Cuba. Ike will be emerging into the Gulf of Mexico once it crosses western Cuba. Though the track is still uncertain, most models indicate that landfall will occur in Texas. Click on the Computer Model Verification map below and see the progression of the spaghetti model for Ike. 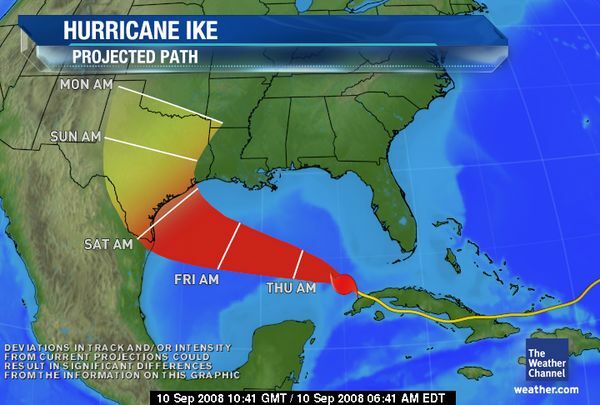 As of 8 AM, Hurricane Ike was located near 22.4 north and 82.4 west, or 40 miles south of Havana, Cuba. Ike is traveling west-northwest at 13 mph with winds of 80 mph. Hurricane Hunter aircraft recently reported a central pressure of 965 mb, or 28.50 inches. A hurricane warning remains in effect for the Cuban provinces of Ciego de Avila, Matanzas, La Habana, Ciudad Habana, Pinar del Rio and the Isle of Youth. A tropical storm warning is in effect for the Florida Keys from Ocean Reef southward to the Dry Tortugas including Florida Bay. Tropical Storm Hanna is moving rapidly up the east coast of the U.S. The storm is located 135 miles southwest of Providence, Rhode Island. Maximum sustained winds remain near 55 mph and the minimum centralized pressure is 992 mb. Hanna is moving northeast at 30 mph. Major Hurricane Ike is now a category 4 hurricane. It is located near the Turks and Caicos with maximum sustained winds near 135 mph. Ike’s minimum centralized pressure is 947 mb. The storm is moving west-southwest at 15 mph. Computer models indicate that Ike could miss Florida altogether with only the Keys and southern most part of the state still within the cone of uncertainty. The storm is now expected to cut across Cuba and then move into the Gulf of Mexico. It is still too early to determine where Ike will eventually make landfall. Tropical Storm Hanna is almost hurricane strength. Location: near latitude 32.4 North and Longitude 79.1 West or about 60 miles east-southeast of Charleston, South Carolina and about 140 miles south-southwest of Wilmington, North Carolina. Maximum Sustained Winds are 70 mph. Minimum Centralized Pressure is 978 mb. Hanna is moving to the north around 20 mph. Tropical storm-force winds extend outward up to 260 miles, mainly to the north and east of the storm’s center. Hurricane Ike is currently a category 3 storm. Ike was near 22.6 north and 65.6 west, or about 360 miles east -northeast of Grand Turk Island. Maximum sustained winds are 115 mph with higher gusts. The estimated central pressure is 958 mb, or 28.29 inches. The hurricane is moving west-southwest at 16 mph. Hurricane force winds extend outward up to 45 miles and tropical storm force winds extend outward up to 120 miles. Josephine has been downgraded to a tropical depression. Josephine was centered around 16.3 north, 35.8 west. This is 785 miles west of the Cape Verde Islands. Maximum sustained winds are estimated to be 35 mph with a central pressure of 1006 mb, or 29.71 inches. Josephine will remain in a hostile environment for the next couple of days due to shear and also cooler waters in its path. Currently moving to the west-northwest at 7 mph, this motion should continue with some increase in forward speed.